This is actually a non-solicited suggestion made to a fellow LCTM member. A very basic and novice-suggestion was posted to the list, and using more or less the same material, I've come up with this. I wanted to make this an entry-level layout, so the construction requirements has been kept down; for such an interesting layout the construction will be surprisingly simple. I dont even think open framework will be necessary. Plan: A smaller station on a single tracked mainline, which is also the terminal station of a smaller secondary line. The layout holds 3 return-loops, Two of them with shaddow-stations. Although there is a limit of 25 switches, there has actually been room for shunting yard, workshop for locos and some industry. Apart from the main station, there is also a small mountain-station for the secondary line. With a few more switches available, more tracks for shaddow-stations should be encluded. 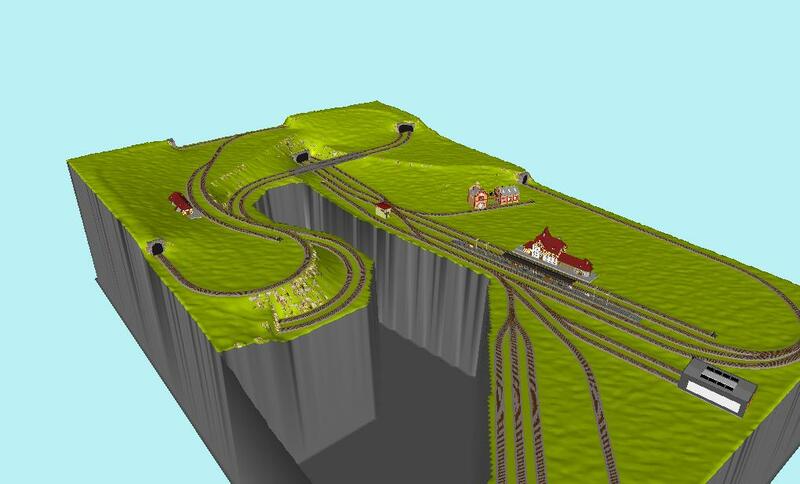 Also the mountain-station could have more track-work with maybe a local industry. Middle level return-loop of main line. Upper level return loop of secondary line.